We talk a lot, a lot about privilege within our team. Given our expertise in privilege training in the US context, we are familiar with talking about the connection between race and poverty, police brutality against Black America, homelessness and queerness among young people, and the particular xenophobia against Latinx and Asian Americans in this country. During the fall of 2016, we witnessed how our political milieu has broad consequences around the world. We started thinking about privilege in the international context. Because our identities exist within a context of a society, our privileges shift in different local contexts. But when we’re talking about international travel, there is also larger historical context we need to keep in mind. We started asking ourselves: What does it mean to be an American visiting Palestine or the countless other countries negatively affected by US foreign policy? How should a white person act in a country when they visit people who have been colonized and/or imperialized by white people? We also started questioning how marginalization also shifts in different contexts. These conversations led to anecdotes from our communities of color and queer communities about their experiences that led to another set of questions: How can we prepare queer people about national and local homophobia and/or transphobia of the different countries? What questions should be answered for the young Black woman headed to Spain or other countries with heightened anti-Blackness? How should Asian- Americans be prepared before heading to Malawi or other contexts with strong xenophobia against people of Asian descent? How will people’s external appearance going to affect their interactions with the local community? We dug deeper from there, only to find more reasons to continue thinking about privilege and oppression abroad as more and more colleges grow their study abroad and international programs. According to NAFSA, 325,339 students studied abroad during the 2015-2016 academic year, which is a 3.8 percent increase from 313,415 students the previous academic year. Many of the 325,339 students going abroad hold the privileges of being American or attending college in the U.S. This privileged identity usually comes with many other privileges tied with socioeconomic class, ability, religion, etc in addition to being citizens or residents of the U.S. Among all these students, 71.6 percent were white students. And we can’t forget about U.S. imperialism in the wider context of international politics alongside colonization by the western world. It is essential to address the workings of power in the international context as well as how the students will interact with it. We found that most of the pre-departure training for these students did not provide students tools to gain a nuanced understanding of themselves and the context. Rather, most training consisted of minimal safety tips such as being aware of their surrounding, and for women students, informing them to be extra careful. A year ago, our diversity catalyst Anthony Daejin Villano helped us craft our first version of “Fish in a New Pond” which drafted the essential tools we wanted to share with students going abroad. Given our team’s overlapping marginalizations, we found it easier to find the solutions for preparing people with marginalized identities in safety, precautions, and intercultural communications. The relatively more difficult task is always tackling privilege that we carry. It’s a harder thing to learn because privilege, for the most part, is invisible to those who have it. The other thing about privilege is that it makes us defensive. We want to justify the privileges we have. We don’t want to accept the immunities and advantages as unearned. In order to break down these barriers, we need models. By models, I mean people who will show us how to come to terms with our privileges, how to understand them in the context they surface, and how to leverage our privileges to uplift those who do not benefit from them. Describe a time when one of your privileges surfaced during your abroad experiences. In what moments did you hold power in these spaces? How and why did you realize your privilege in this instance and what did you do about it? How were you aware of your national identity, gender, race, etc. in contrast to where you were? 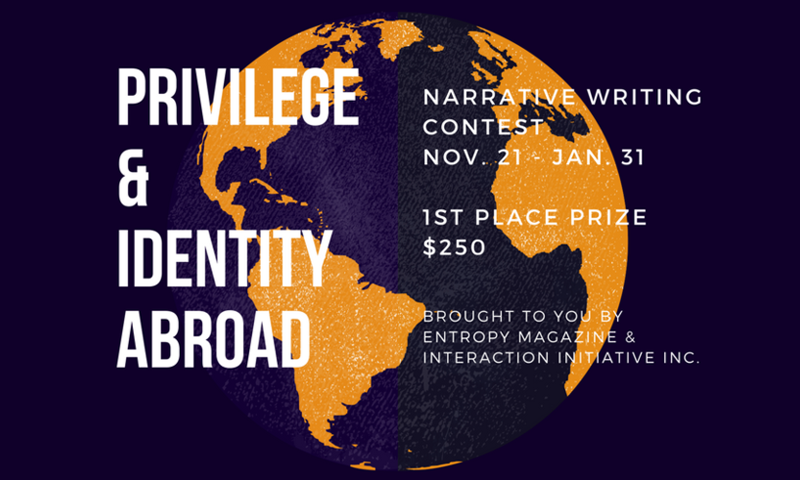 We partnered with Janice Lee, the Founder and Executive Editor of Entropy Magazine, to provide a wider platform for the narratives exploring privilege abroad. We are excited to learn from the writers’ experiences and to share them as models to open the eyes of those who go abroad.